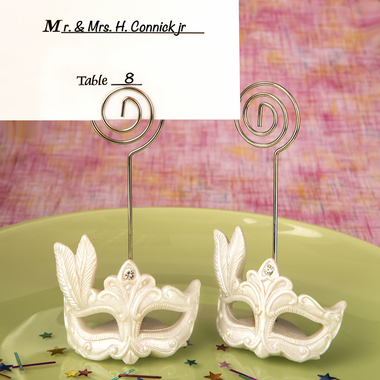 Guide your guests to their seats with fascinating masquerade place card holders at your Mardi Gras theme party. Great for proms, birthday parties, Bar or Bat Mitzvah, or any masquerade party. The feathered mask base of white poly resin extends into a sturdy coiled metal wire to hold a placecard. Fine details like the rhinestone accent on this holder will not go unnoticed, when your guests use it to display visiting cards or their favorite photos. Mix and match these Mardi Gras themed placecard holders with our Mardi Gras themed masked key chains to create the fun and festive vibe you want in your party venue! Measuring 3 3/4" x 2 1/4", each placecard h holder has a blank place card included. They come bulk packed.